App Dev Manager Ricardo de Almeida shares insight on helping customers solve problems with software portfolio tracking by using Azure DevOps and TFS in a more interactive way. The first step is by helping customer understand that agile project management is a paradigm breaker for those coming from traditional software project management methodologies. Several mindset changes will be required, but aside from the differences in both methods, it’s important to put the needs of the business first. If part of this transition requires that aspects from the legacy process be kept, it’s a great opportunity to demonstrate that through the use of agile process and agile tools, we can have an even better control of the value (beyond just software) that the development team is creating for the company. More importantly, it’s now all happening in an incremental and interactive way. We have a well-documented process to use Azure Boards and TFS to configure a great software portfolio to be used by Product Owners and Feature Teams. To align the best perspectives from traditional and agile software development management, I’ve been working with my customers by using Delivery Plans that is an amazing Azure DevOps’ extensions (Also available to TFS). 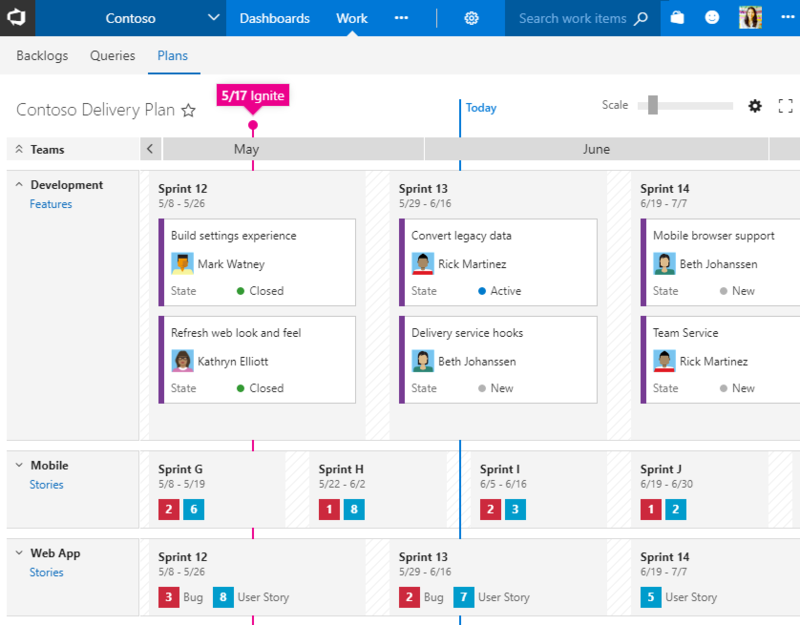 This allows PMO’s members and Software’s teams to do provide management of their portfolio and work in different levels of abstraction with a calendar based view across teams and projects using Azure Boards and TFS. The inclusion of Delivery Plans in the portfolio management process through Azure DevOps and TFS is helping my customers to make the PMO’s life easier because of the collaborative, constant and automated portfolio update. This extension is also helping us to make the software development process much more transparent for everyone and turning Projects’ teams and Feature Teams in one product team.